The tradition of symbolizing rank or status with a medal or a badge has been around for centuries. Royalty from around the world were fond of giving away accolades in the form of ribboned medals or small pins with the royal seal. These fine gifts were always unique in design, a one of a kind heirloom that denoted pride and accomplishment. The evolution of the badge as a symbol of authority has spanned over 150 years. The city of Pittsburgh created their first police badge in 1873. As law enforcement evolved, so did the design of the badge. While at first the â€œmodernâ€ badge was used as a source of identification only such as â€œlaw enforcementâ€, it now denotes more personal information such as name, rank, city, state etc. Over the past few decades the process of making a badge has changed dramatically. Better materials and newer technology have allowed the badge manufacturer to become more detailed and much more personalized than in earlier years. 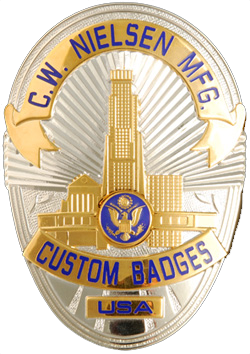 Custom badges have become easier to produce and more desired by public officials than ever. Thanks to the development of graphic design software, the badge manufacturer can produce for the customer an artistic rendition of a badge so realistic it looks as though its already been produced. The badges of today are recognized as safety, security and integrity by the public. The wearer feels the same sense of pride and accomplishment as if given a royal award. We at C.W. Nielsen recognize the importance of a badge to the wearer and to the public. Every effort goes into creating a badge made well enough to be handed down for generations. We value time and tradition, and honor the rich history that surrounds the meaning of the word â€œbadgeâ€. C.W. 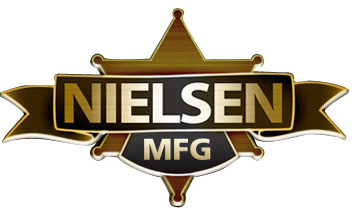 Nielsen Mfg. Corp. is more than just a badge company, we are a manufacturing jeweler. Just as fine jewelry promotes a certain status, so does a finely crafted badge promote a level of pride and satisfaction. All of our various qualities, from nickel up to gold filled, are lettered, assembled, and finished with the same care a piece of fine jewelry is given. Our badges are made with solid backs and hard soldered attachments,guaranteed to last. Truly a magnificent article of unmatched beauty and fineness. Handcrafted entirely in the USA, Nielsen badges are a tribute to experience and tradition. We excel in a level of customer satisfaction that spans five decades. Our traditional line of badges is made with quality and integrity. Tools and routines in the manufacturing of badges may have changed over the years, but our dedication to providing our customers with a finely made badge has not.